Cork is what happens when Dublin & Galway collide at extreme velocity. The 'real' capital of Ireland as Cork natives (or Corkonians) like to say (or 'sing', as the accent is very melodic!). Home to the famous Blarney Castle and the Blarney Stone - which when kissed, gives the 'gift of the gab' – eloquence. The 2nd city of Ireland, Cork has a rich cultural and musical heritage. Cork harbour is also said to be the 2nd largest natural harbour in the world after Sydney... but don't let all these statistics of '2nd place' fool you – Cork is 1st rate when it comes to internships, with a wealth of professional & technical/scientific internships available. Internships available in most sectors: technical/engineering internships, business internships, social/NGO internships. Local support & social programme available in Cork through our friendly partner school, you definitely won't have to worry about making friends! From outside Ireland - good access from many European countries to Cork Airport. Regular bus from Dublin. 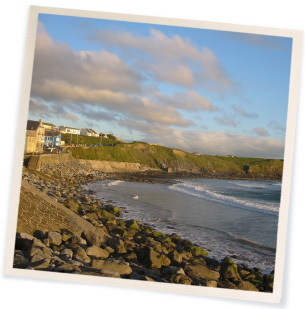 Ideal location for touring west/south-west/south-east Ireland.